1-CD with 24-page booklet, 32 tracks. Total playing time: 75:16 mns. •	Contains ultra-rare rocking singles on the Fox and Fraternity labels by The Jiv-A-Tones, Ric Cartey's one-time backing band, and Jiv-A-Tones leader Charlie Broome's impossibly hard-to-find early '60s solo single on O.E.K. When the smoke cleared, both James and Hunter had scored number one U.S. pop smashes with their respective renditions of Young Love in consecutive weeks of February of 1957. Cartey would have to content himself with having written a #1 hit for two other singers instead of enjoying one with his own rendition. Cartey and The Jiv-A-Tones wouldn’t stick together after Young Love became an international sensation. Ric’s RCA Victor encore single doesn’t credit The Jiv-A-Tones on the label, but Jerry Reed was in charge of the dazzling lead guitar on both sides, this time wielding an acoustic axe. He wrote the rollicking vocal group-backed I Wancha To Know, sporting a particularly wild vocal from Ric Cartey. Then RCA Victor sent Ric ,Cartey up to Nashville to work with producer Chet Atkins. On March 29, 1957, Atkins convened Reed and Jack Eubanks on guitars, A-Team bassist Bob Moore, drummer Jeff Richards, and a male vocal group, The Sunshine Quartet, for Ric’s first Music Row session. RCA sat on both of Ric ,Cartey’s originals from the date, Gotta Be Love and the ballad Crying Goodbye, but the label thought enough of the remaining two songs to press them up as a single. Let Me Tell You About Love, an easy-going rocker was written by Joe South. The flip side of Ric’s single, a determined Born To Love One Woman, was a cover of a then–current single by newcomer Don Johnston on Mercury. Atkins tried again with Cartey on July 15 of ’57. Two songs Ric waxed that day were covers of tough Chicago blues songs. Willie Dixon’s My Babe was a 1955 R&,B chart-topper for Little Walter and lent itself well to the rockabilly idiom. Aided by a typically vicious Reed guitar break, Cartey did the tune justice. The Dixon-penned Mellow Down Easy similarly suited to Cartey’s rockabilly approach, slashing lead guitar careening around the studio behind him. RCA teamed them as Ric’s last single for the label. Somehow Ric Cartey managed the to make a one-off single for ABC-Paramount in 1963. Poor Me was set at an infectious mid-tempo pace. Something In My Eye was bright and breezy. But Ric ,Cartey wouldn’t be asked back to make another ABC single. Two versions—not one, mind you, but two--of Ric Cartey’s first recorded composition topped the pop hit parade in early 1957. Ric’s own rendition of Young Love, which he’d written with fellow teenager Carole Joyner, wasn’t one of them. The honors went instead to country singer Sonny James and neophyte pop crooner Tab Hunter. That didn’t stop Cartey from subsequently cutting enough solid rockers for RCA Victor, NRC, and his own El Rico label. Broome dreamed up the distinctive guitar introduction to Young Love. “‘Young Love’ was written in the music room of my parents’ house and grandparents’ house,” he says. “(Carole) wrote this nice poem, which was the song, and Ric put it to music.” Ric and Charlie’s band, The Jiva-Tones (as their name was spelled on the record label) cut Young Love for local broadcast personality Bill Lowery’s new Stars, Inc. record label in 1956 at a country radio station in Decatur, Ga. On the other side sat the blistering rocker Oooh-Eeee. 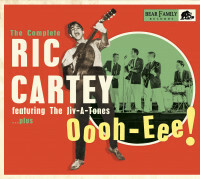 It was written by Jerry Reed, who supplied the hot guitar licks as he had on Chuck’s Atha’s original for Stars, Inc. “On ‘Oooh-Eeee,’ Jerry was playing the electric, and I was playing the (rhythm),” says Broome of Cartey’s version. Capitol Records A&R man Ken Nelson had James cover Young Love, and Hunter then covered James for Dot. As both versions sailed up the pop charts. 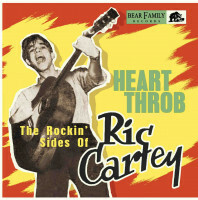 RCA acquired Ric’s original from Lowery for national consumption, but Cartey somehow avoided hit status. Ric and the Jiv-A-Tones soon parted ways; the band would spread lead vocals between Broome and new guitarists Dean Stevens and Bill Holden, soon cutting a rocking 1957 single pairing Fire Engine Baby and Flirty Gertie on Lowery’s Fox logo and then the vicious instrumental The Wild Bird for Fraternity. Victor hung with its new acquisition, issuing Ric’s Atlanta-cut encore. Reed wrote the highly animated I Wancha To Know as one side of Cartey’s encore, returning to supply dazzling acoustic lead guitar. For his tweaking of the lyrics, Jerry earned half-authorship on the pulsing flip Heart Throb, splitting credit with Alabama-born Tommy Spurlin, who had waxed the number for Harold Doane’s Miami-based Perfect Records (Doane archived it). 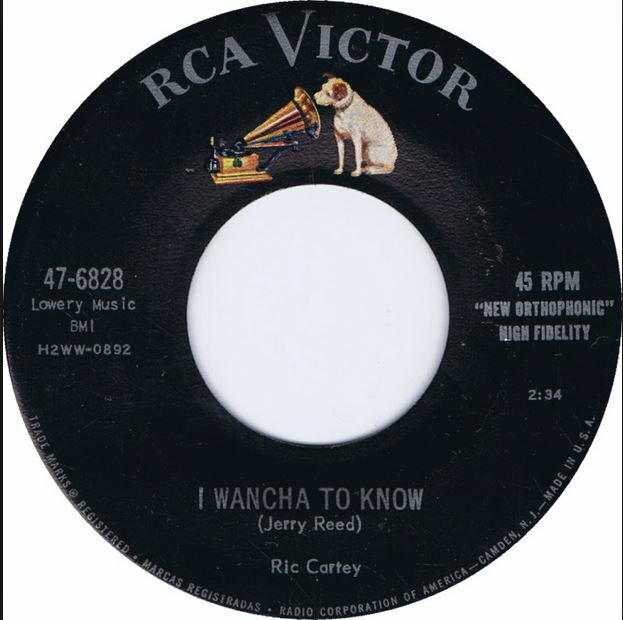 RCA sent Cartey to Nashville in March of ’57 to work with producer Chet Atkins (Reed remained his lead guitarist, sharing fret duties with Jack Eubanks). Joe South was doing business under his birth surname of Souter when he penned Let Me Tell You About Love, an easy-going rocker that could have suited Sanford Clark. The flip side of Ric’s single, Born To Love One Woman, was a cover of a single by newcomer Don Johnston on Mercury. Don later changed his first name to Bob, snagged a staff producing gig at Columbia, and helmed classics for Simon & Garfunkel, Bob Dylan, and Johnny Cash. RCA vaulted Cartey’s original Gotta Be Love from the same date. Atkins brought Cartey back to Music Row that July to cut his RCA farewell single with Reed and Eubanks again manning the guitars and newcomer Ray Ragsdale added on piano (you know him better as Ray Stevens). Both sides of Ric’s last RCA release were covers of Chicago blues classics by harmonica genius Little Walter on the Checker imprint. My Babe, a 1955 R&B chart-topper for Walter, was Willie Dixon’s secular adaptation of the gospel theme This Train; the Dixon-penned Mellow Down Easy had immediately preceded it on Walter’s release slate. Cartey gravitated over to Lowery’s recently established NRC label in 1958 to wax Scratching On My Screen, a romping variation on Washboard Sam’s 1939 blues Diggin’ My Potatoes for Bluebird Records. Ric seems to have been a Chicago blues fan. He later revisited Mellow Down Easy on his own El Rico label with more of an R&B feel, issuing it under the concise alias of Rex (no last name). 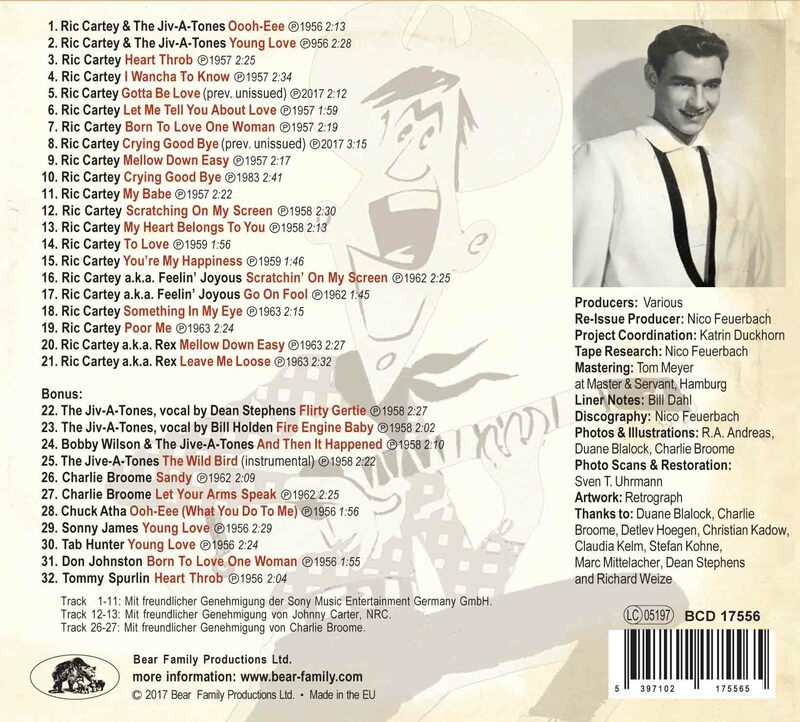 Although Young Love was Cartey’s calling card for the rest of his life (he died August 5, 2009 in his adopted hometown of Palm Harbor, Florida), he left us a legacy filled with rollicking rockabilly. 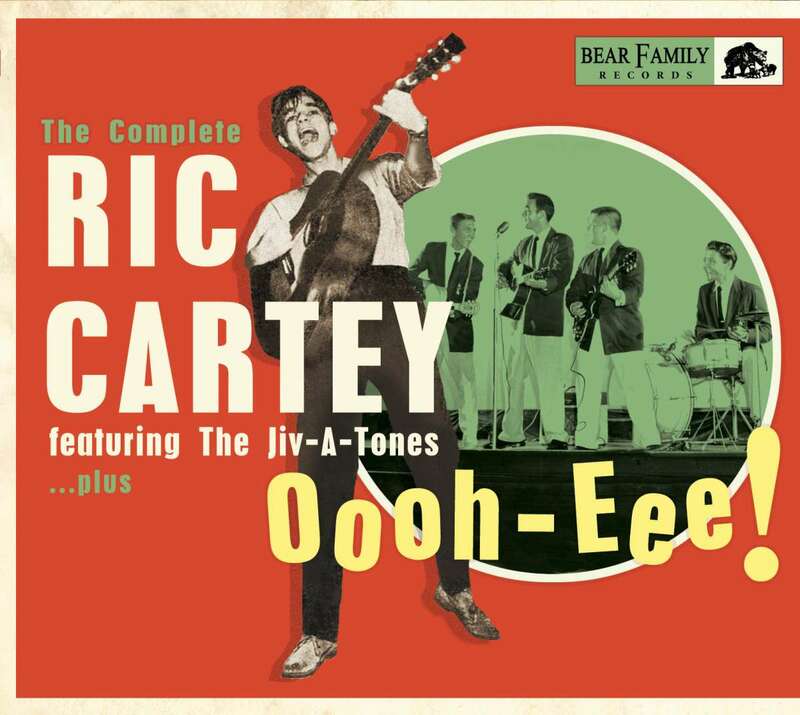 Customer evaluation for "Oooh-Eee - The Complete Ric Cartey Featuring The Jiv-A-Tones, plus (CD)"
Musikreviews, 24.06.2018 " „Oooh-Eee! - The Complete RIC CARTEY“ ist ein weiteres Stück liebevoll gestaltete Rock‘n‘Roll-Musikgeschichte in sehr gut remasterten Sound sowie Wort und Bild – das letzte große Vermächtnis des fast vergessenen Rock‘n‘Rollers aus Atlanta! OX # 138	"Wenn auf etwas Verlass ist, dann darauf, dass aus dem Hause Bear Family nur originale Perlen kommen. So ist es auch mit dieser Gesamtwerkschau von Ric Cartey. Ein Muss für Fans dieses Stils." Habe die CD heute erhalten und bin total begeistert!